Savour the freshness of summer fruit wherever you are. Our merry berry couscous is a real treat. Serve as cereal for breakfast, hot or cold, or as dessert. Try it, you'll love it! Surprisingly fast and easy to prepare, this dish will give you a boost every single time. Don’t leave home without it! 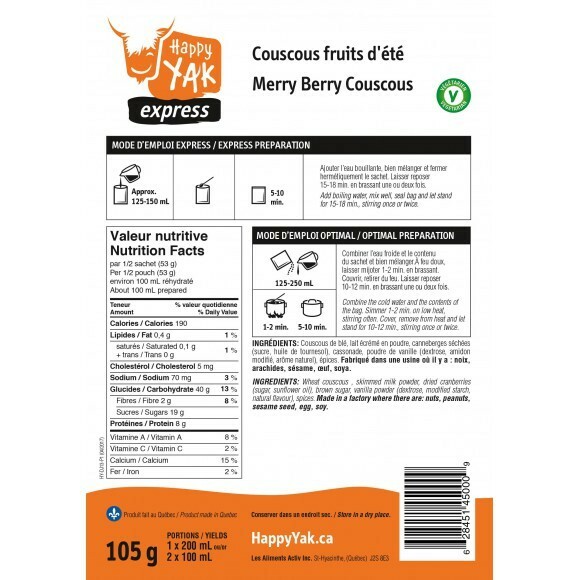 A Yak Express selection Merry berry couscous will tickle your taste buds with excitement. It is light, tasty, and slightly sweet with a hint of vanilla. A true delight for your palate. Did you know? Couscous is the staple and the national dish of several countries. Historians are divided as to its origin; some of them claim it would be native to China, others from East Africa, some time before Christ, some time in the 9th century. However, it expanded rapidly in the 11th century, thanks mainly to the development of wheat crops. Couscous is associated with virtues, symbols and spiritual beliefs.